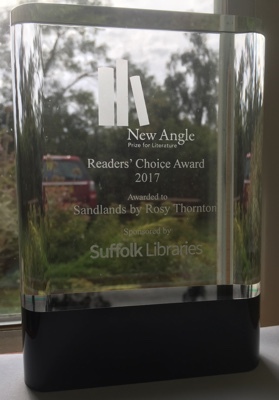 At the 2017 New Angle Prize awards dinner on 6th September I was amazed – and absolutely delighted – to receive the Readers’ Choice Award, sponsored by Suffolk Libraries and based on voting by members of the public.. In March 2017 I was excited to hear that my short story collection, ‘Sandlands’, is on the longlist for the Edge Hill Prize 2017. I was honoured and delighted when my fifth novel, NINEPINS, won the East Anglian Book Awards prize for fiction in November 2012.